Voting open now through September 27! 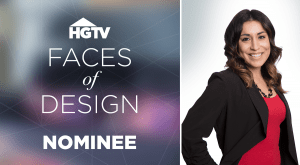 HGTV editors have selected Senior Interior Designer Alison Green as one of fourteen talented finalists to compete in the 2018 “Faces of Design” competition in the “Color + Pattern” category. The national awards program features exceptional designers in 8 categories: Kitchen + Dining, Color + Pattern, Waterside Retreats, Big City Digs, Master Retreats, Countryside Escapes, Dramatic Before and Afters, and Living Large in Small Spaces. challenges of working within historical registry requirements to achieve the homeowner’s vision. 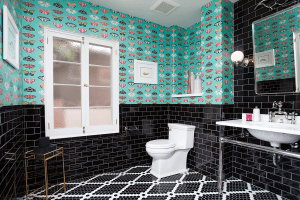 The home now communicates the homeowners’ lifestyle with colorful and unconventional elements, such as striking wallpapers and vintage-inspired hand sconces. Each room possesses a distinct personality while the whole home enhances indoor/outdoor living and captures amazing views. Vote for Us Today and Remember … You Can Vote Once a Day! Click here to vote. Voting is open until 2:00 p.m. PST on September 27, 2018. Visitors can cast one vote per category per day.